I used Rufus for a long time to create USB installation media for Linux or Windows, but did not review the software before 2017 here on this site. You can check out the Rufus review here for a general overview of the program's functionality. The interface of Rufus changed quite a bit in the new version to better highlight the "flow of user operations". Drive Properties include an option to show advanced properties; most users don't need these probably but they may be useful for advanced use scenarios. You may use the options to list all USB hard drives, add fixes for old BIOSes, or use the Rufus MBR with BIOS ID. Rufus 3.0 is a well designed program for Windows to turn ISO images into bootable media. The new version changes the interface slightly but for the better in my opinion. Now You: Which program do you use to create bootable media? as I recall, the prior version insisted on formatting the entire target usbdrive to a single FAT32 partition. In the new, EFI-capable version, aside from the EFI partition, are we able to choose formatting the data partition as ext2/3/4? 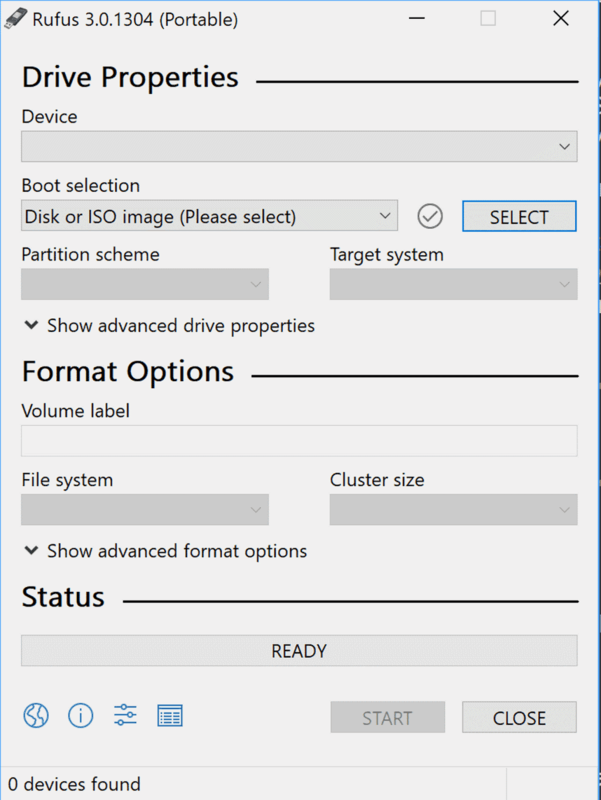 Can we choose to have rufus create multiple data partitions? Can we specify “install to existing partition on the target drive”? Rufus does not support multiple partitions. I cannot check the file system options right now, unfortunately. I use Rufus as well. Never had a problem and I’ve been using it for years now. I hate Rufus because it cannot make more than one ISO image at the same time. Like when finished there has to be windows 7, 8.1 & 10 to select while booting. But it can’t. I generally use YUMI because it can build 4 Gig persistence on a thumb drive if the distro allows it. It can also install multiple ISOs on one thumb drive. Rufus however has reformatted screwed up thumb drives that other formatter’s could not. Rufus is my favorite tool for create boot USB. Can’t remember when I did not use Rufus for bootable drives. I think 3.0 is even easier and possibly faster but it was plenty fast before so its hard to say. Can this or a similar program create a bootable USB from the installed OS (Win 10)? I have Win 8.1 too on a external drive that was removed from my previous laptop. Whether that one is bootable as is I don’t know. I have some ~2yr old Linux versions on CD/DVD, for which I would need to use an external CD drive. I can’t download a gi-normous image because I only have 2GB/month. Mostly just want something other than the Win 10 C: to boot from as a backup and/or alternative to experiment with. I haven’t messed with boot partitions and such since they were done with DOS programs. I miss my floppy disks, dial-up BBSs, Norton Utilities for DOS, and typing in hex code from PC Mag to create utility programs.. Still can’t figure out how WIFI works or what exactly a VPN does. I’ve used Rufus on Windows for some years and only had one issue. I’ve assumed that was a defective flash drive but I did the long verification on it beforehand yet it didn’t work after a seemingly successful write. Still a pretty great success rate since it’s an isolated event. Less lucky on Mac since Diskmaker X stopped working not too long ago but the Apple command line utility has been a fine alternative. Had to copy and paste carefully from an article though since I don’t know quite what I’m doing with terminals. Never looked back since I started using Rufus…..and it’s yet to disappoint me..! I downloaded Rufus 3 to my Win10 Laptop, a few days later Windows Defender periodic scanner declared it was a virus, anyone else have this happen? Tom, did you download it from the official website? Did you check how it was classified exactly? This must be an error but it is difficult to tell without further information.